I have a sick obsession with the Dollar Tree. I'm really just too frugal for my own good. But, for only a dollar, I can buy a plethora of general items. 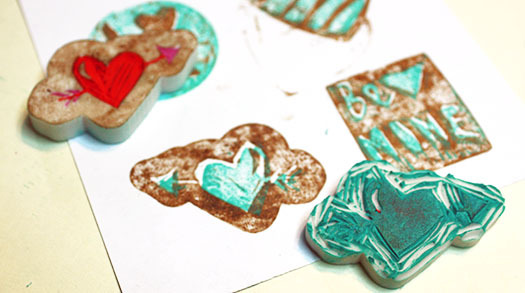 I'm always on the lookout for anything I can incorporate into a craft. 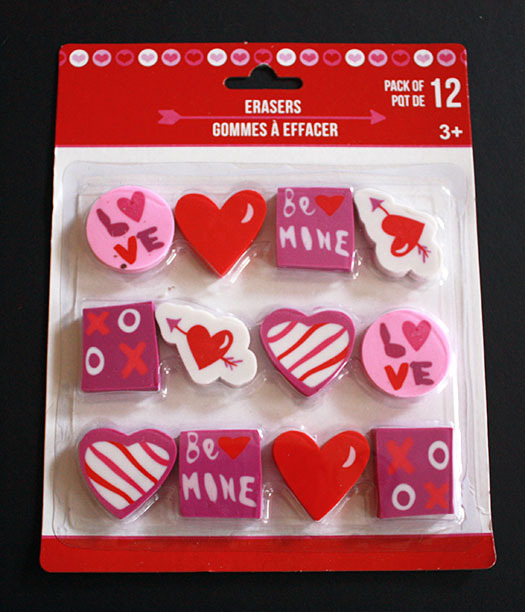 On a recent trip, I picked up some Valentine's erasers. Here's what you can do with them. 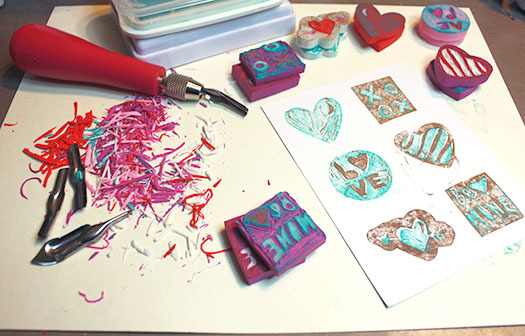 I bought this unsuspecting pack of holiday erasers, already figuring I could make some stamps. I was a total dummy though and completely forgot to take into account that words/letters need to be reversed for stamps in order to read them. Duh! Fortunately, I got a happy surprise when I opened the packaging. Those manufacturers must have known this would be the perfect craft! 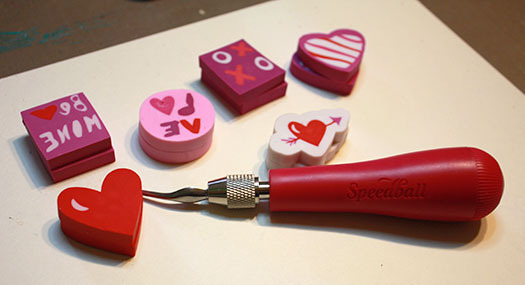 I stacked the erasers into pairs (making sure they matched up perfectly) and grabbed my Speedball Linoleum Cutter. I worked on top of a piece of paper so cleanup would be easy. I started with what I thought would be easiest and worked to hardest to make sure I got into the groove of carving before it got too hard. 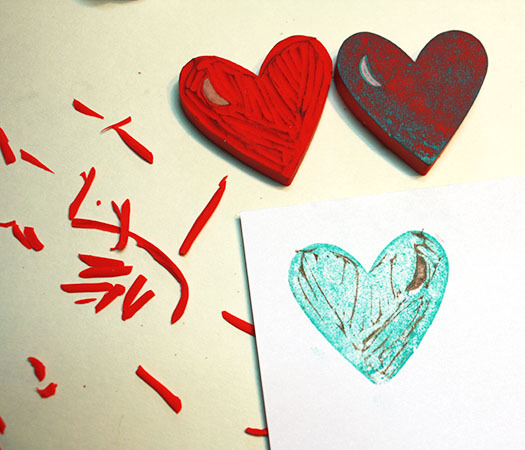 The heart with the single crescent got the first chunks taken out of it. 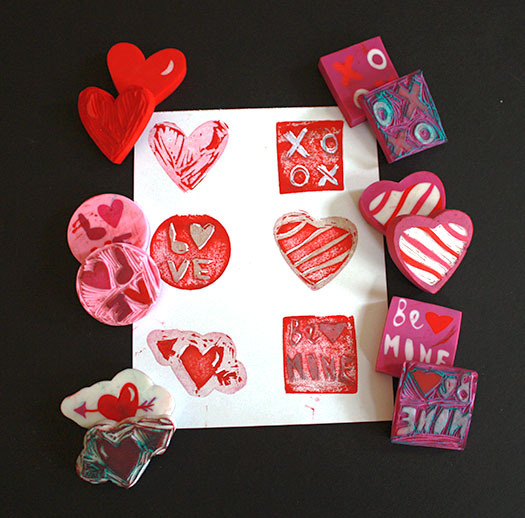 Again, ensure you have the erasers perfectly matched and carve on the same side so you can make the stamps interlocking. This was another huge bonus in this one buck purchase. After completing each pair, I tested them on a slip of paper to see if I needed to carve off any more of the eraser. 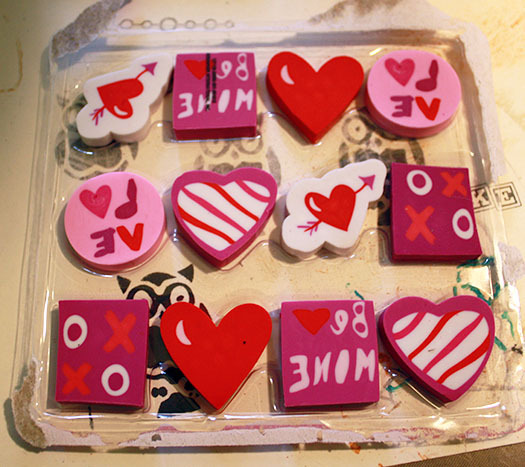 I repeated this process for all the pairs. As I predicted, the last pair gave me trouble because of its intricacy. 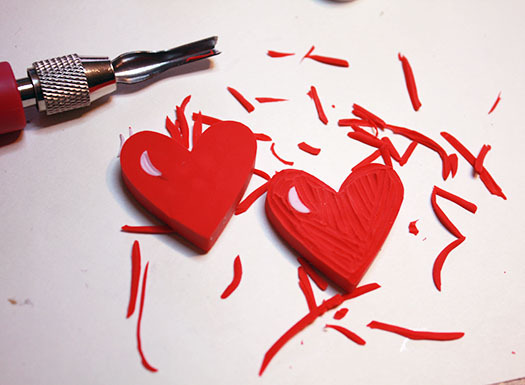 I had to test and re-carve several times. While it isn't perfect, I'm happy with how it came together. I had quite a mess when I was finished. 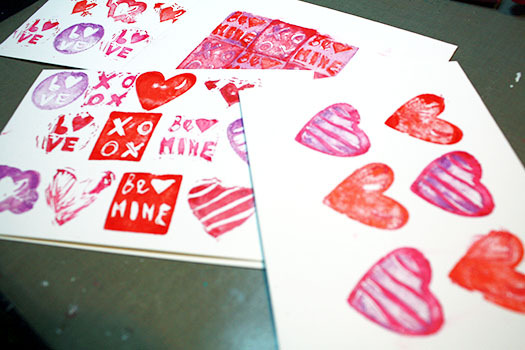 I lucked up even more at the Dollar Tree and discovered a couple of blank card sets - perfect for making Valentine Cards with my stamps! Let me say that the cards have a slick surface, much like regular greeting cards. 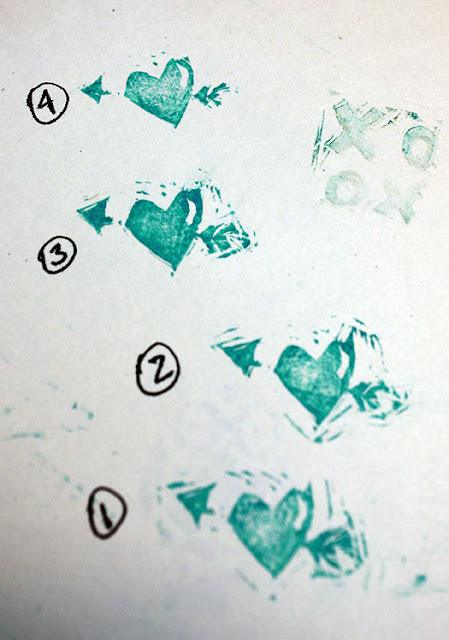 I had to be careful with the stamps as I put the ink down because they did want to slip. While I was really excited about the ability to inlay the designs, I think they each look great on their own too. 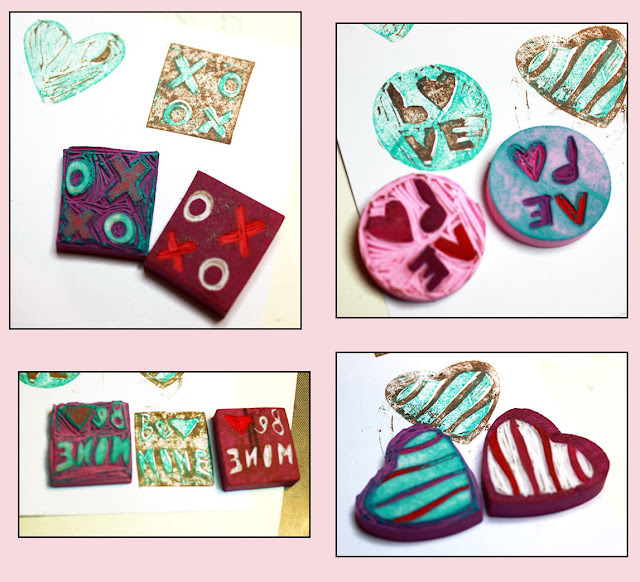 I can't wait to find some more uses for these and find more erasers for upcoming holidays! 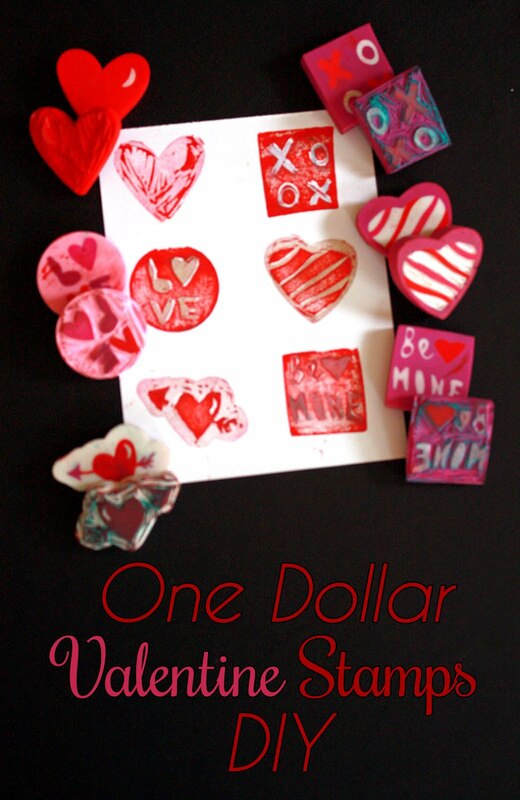 What Dollar Store scores have you repurposed lately? 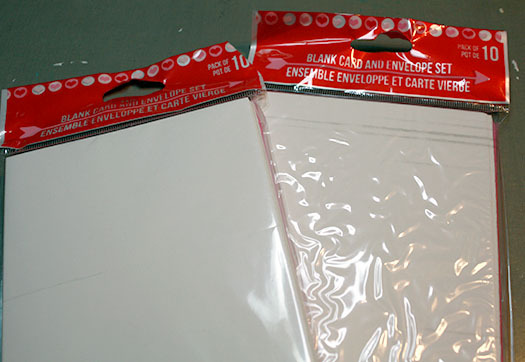 I never seem to be end up with craft products. I walk out with dishes and other doodads that I don't need. I love the green and brown ones the best! 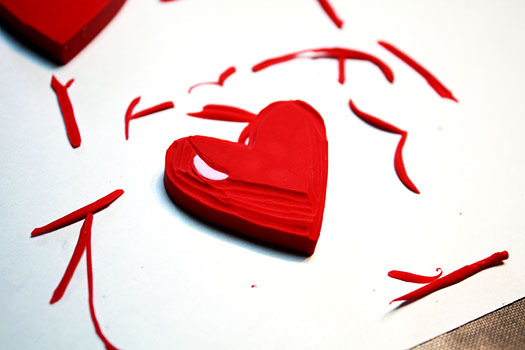 You are so smart to be frugal where you can and save that money for the things that are expensive, like tools. Beautiful, clever work! 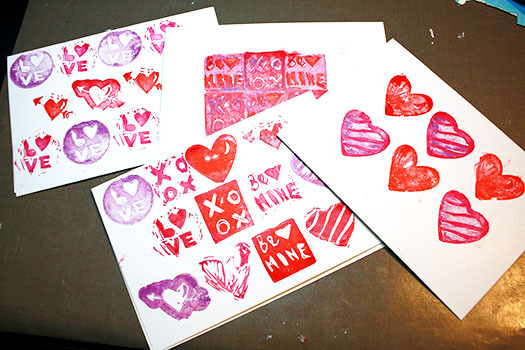 I love making Valentines and one year gathered some friends and we made Valentines for older people we knew. It was so much fun . . . I really need to do it again! Thanks for the fun ideas. Veralynne, Isn't it the best for those little splurge moments when you don't really want to spend too much? I'm sure your centerpiece turned out beautifully! Kathy, Thanks. I had a lot of fun honing my carving skills. I was so glad to luck up with the backs having the reverse on them. Score! !